We ended up at the Sol de Mayo waterfall by accident. Originally we had planned to go to Todos Santos, but after hearing there was construction on the road we switched to Santiago. In search of hot springs. A little before we reached Santiago, we stopped at the Tropic of Cancer to take a few photos. There we noticed a faded newspaper article advertising a waterfall. It was a very hot day and a waterfall sounded much more appealing than hot springs. And the trek began. 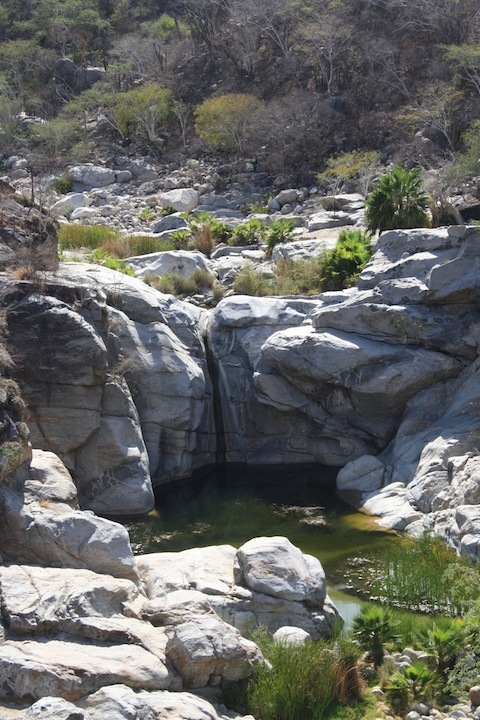 The Sol de Mayo waterfall is only about 20 minutes outside of Santiago in the Sierra La Laguna Biosphere, but is almost impossible to find without careful attention to detail. Once you take the road up above Santiago, you must follow a series of dirt paths, guided only by the occasional sign saying Sol de Mayo. We missed several of them, so be careful. The roads are very dusty and you have to go over several “cattle gates” to get there. We could barely see the car ahead of us due to the large dust cloud they left behind. The first thing you see when you arrive is the Rancho Ecologoico Sol de Mayo. This is a little ranch where you can grab something to eat and drink or even stay the night (there are a few cabins which are actually very nice). They will direct you to the path down to the waterfall. As we found out (sadly, since we all wanted to go swimming) the waterfall dries up in the summer. In October and November after the rainy season the waterfall is in full force. That’s when most people come and swim in the water! Overall, the waterfall was still very beautiful and we will definitely remember our journey getting there. Have you been to the waterfall?